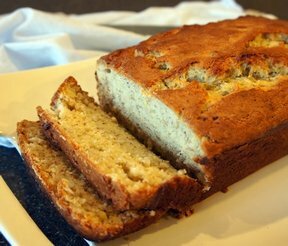 Using a slow cooker is an alternative method for baking banana bread. 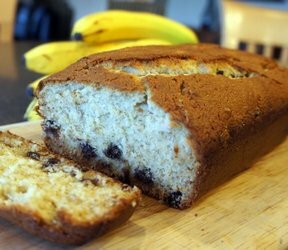 Rather than starting up your oven, try baking this slow cooker banana bread. 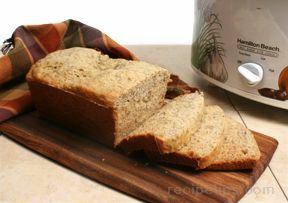 See our Slow Cooker Conversion chart to cook your favorite banana bread recipes and other recipes in a slow cooker. Grease and flour the bottom and sides of a loaf pan. Mash the bananas with a fork. Set the mashed bananas aside until needed. In a mixing bowl, beat the shortening, sugar, and eggs together until fluffy. Add the dry ingredients and beat until well blended. Stir the mashed banana into the batter. Stir until they are well distributed. Tent foil over the loaf pan so that it will leave room for the bread to rise. Seal the foil around the edges. The foil will help keep the bread moist. Place a rack on the bottom of a 6 quart slow cooker so the pan will not be setting on the bottom. If you do not have a rack that fits, use crumple up aluminum foil. Place on the bottom of the slow cooker to keep loaf pan off the bottom. Place the pan in the slow cooker. The foil or rack in the bottom will allow the heat to circulate around the loaf pan for even cooking. Cover and turn on high. Cook for 2 to 3 hours. Do not remove cover or check for doneness before 2 hours. Check for doneness by inserting a toothpick into the middle of the loaf. It should come out clean if the bread is done. If not done, leave the foil off and cover the crock with a paper towel; then place the cover back on the slow cooker. Cook for an additional 30 minutes and check doneness again. When the bread is done, allow it to cool for 10 minutes before removing it from the pan. 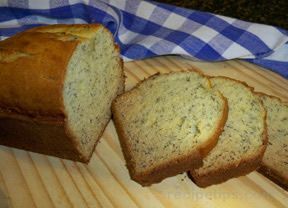 The banana bread can be served warm or allowed to cool before serving.